After starting the engine, this DTC is stored when the engine stops without the ignition switch being operated. Using the Techstream, the conditions present when the DTC was stored can be confirmed by referring to the freeze frame data. Freeze frame data records engine conditions when a malfunction occurs. This information can be useful when troubleshooting. It is necessary to check if the vehicle has ran out of fuel before performing troubleshooting, as this DTC is also stored when the engine stalls due to running out of fuel. After monitoring for startability problems (P1604) finishes and 5 seconds or more elapse after starting the engine, with the engine running, the engine stops (the engine speed drops to 200 rpm or less) without the ignition switch being operated for 0.5 seconds or more (1 trip detection logic). This DTC is stored if the engine speed drops below the set speed. It is necessary to check if the vehicle ran out of fuel before performing troubleshooting, as this DTC is also stored when idling is unstable due to running out of fuel. After 5 seconds or more elapse after starting the engine, with the engine running, the engine speed drops to 400 rpm or less (1 trip detection logic). 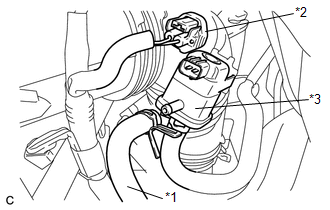 Refer to DTC P0351 for ignition coil assembly circuit (See page ). Refer to DTC P2195 for air fuel ratio sensor circuit (See page ). Refer EVAP System for purge VSV circuit (See page ). Refer to Fuel Pump Control Circuit (See page ). In contrast to normal malfunction diagnosis for components, circuits and systems, DTCs P1603 and P1605 are used to determine the malfunctioning area from the problem symptoms and freeze frame data when the user mentions problems such as engine stall. As these DTCs can be stored as a result of certain user actions, even if these DTCs are output, if the customer makes no mention of problems, clear these DTCs without performing any troubleshooting and return the vehicle to the customer. If any other DTCs are output, perform troubleshooting for those DTCs first. Use any information from the customer problem analysis about the condition of the vehicle at the time when the problem occurred (how the engine stopped, conditions when the engine was restarted, etc.) as a reference. Read freeze frame data using the Techstream. Freeze frame data records engine conditions when a malfunction occurs. This information can be useful when troubleshooting. When confirming the freeze frame data, be sure to check all 5 sets of freeze frame data (See page ). When DTC P1603 (Engine Stall History) is stored, DTC P1605 (Rough Idling) is also stored. When confirming freeze frame data, check DTC P1605. The ECM stores DTC P1605 first. Therefore, 5 sets of freeze frame data can be confirmed through DTC P1605, enabling the technician to obtain more information. When confirming freeze frame data, if there are multiple items related to the cause of the malfunction, perform troubleshooting for all related items. Try to operate the vehicle under the conditions recorded in the freeze frame data which were present when the malfunction occurred. Confirm the data at this time and the data when the engine is idling (engine warmed up, no load, and shift lever in D or N) and compare these data with the freeze frame data. Inspections take into account the fact that the malfunction may not have reoccurred and place emphasis on checking the vehicle conditions present at the time when the malfunction occurred. When performing inspections, jiggle the relevant wire harnesses and connectors in an attempt to reproduce malfunctions that do not always occur. Using freeze frame data, narrow down the parts to be inspected according to the vehicle conditions at the time when the malfunction occurred. If the engine stalled when the intake air volume was low (during idling or deceleration), there may be a decrease in torque due to an incorrect air fuel ratio, etc. If the engine stalled when the intake air volume was high (during driving or acceleration), there may be a major malfunction such as continuous misfire due to ignition stoppage, fuel injection stoppage, etc. and the torque drops to zero. If the engine speed decreased slowly, there may have been a decrease in torque due to an air fuel ratio that was incorrect (by approximately 20 to 30%), etc. If the engine speed decreased rapidly, there may have been a malfunction such as when the engine misfires almost continuously due to ignition stoppage, fuel injection stoppage, etc., or when the external load increases due to an external part malfunctioning. 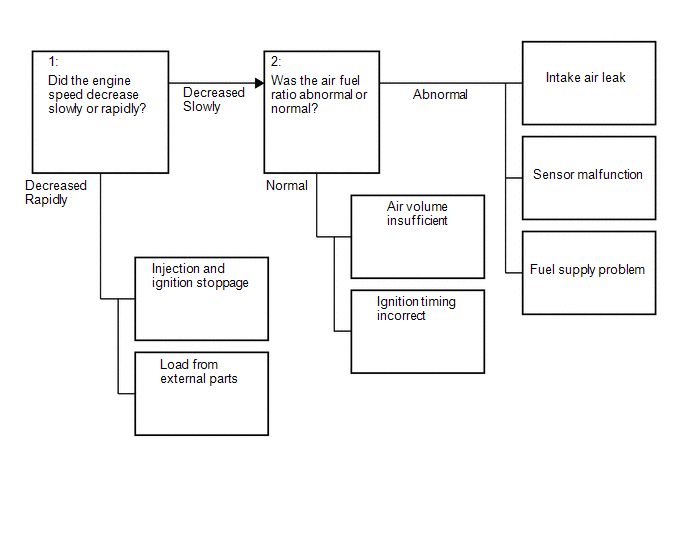 If the air fuel ratio is abnormal, there may have been an intake air leak, sensor malfunction, or fuel supply problem. If the vehicle was normal, the air volume may have been insufficient or the ignition timing may have been incorrect. P1603 inspection flow: Narrow down the parts to be inspected according to the vehicle conditions at the time when the malfunction occurred (freeze frame data). 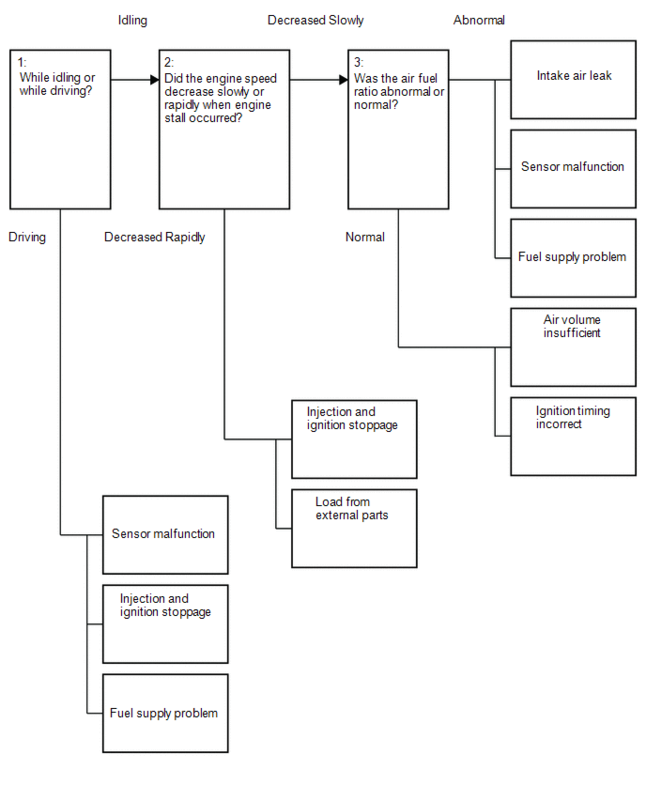 P1605 inspection flow: Narrow down the parts to be inspected according to the vehicle conditions at the time when the malfunction occurred (freeze frame data). (e) Read the DTCs (See page ). If any DTCs other than P1603 or P1605 are output, troubleshoot those DTCs first. Immobiliser Fuel Cut is OFF. (d) Enter the following menus: Powertrain / Engine / Data List / Immobiliser Communication and Immobiliser Fuel Cut. (e) Check the Data List indication. *1: A rapid decrease in engine speed may be caused by an electrical fault in the shared wiring of all or a number of cylinders, an increase in load from external parts, etc. The engine speed is considered to have decreased rapidly if either of the following conditions applies. Otherwise, the engine speed is considered to have decreased slowly. In the freeze frame data, the decrease in engine speed from #3 to #5 is 400 rpm or more. In the freeze frame data, the engine speed at #5 is 120 rpm or less. *2: When a DTC is stored, feedback compensation increases because the air fuel ratio is determined to be lean. *3: When a DTC is stored, feedback compensation decreases because the air fuel ratio is determined to be rich. *4: This item should be checked when DTC P1603 is output and is not necessary to check when only P1605 is output. (a) Check for air leakage in the intake system [vacuum hose disconnection, cracks, damaged gaskets, etc.] (See page ). If the accelerator pedal is released after racing the engine, the inspection is easier to perform because the vacuum inside the intake pipes increases and the air suction noise becomes louder. If Short FT and Long FT are largely different from the normal values when idling (the intake air volume is small) and almost the same as the normal values when racing the engine (the intake air volume is high), air leakage may be present. There is no air leakage. (a) Disconnect the purge hose (on the canister side) of the purge VSV. (d) Disconnect the connector of the purge VSV. (e) Check if air flows through the purge VSV. When this inspection is performed, the MIL may illuminate. After finishing the inspection, check and clear DTCs (See page ). (c) Start the engine and warm it up until the engine coolant temperature stabilizes. The A/C switch and all accessory switches should be off. 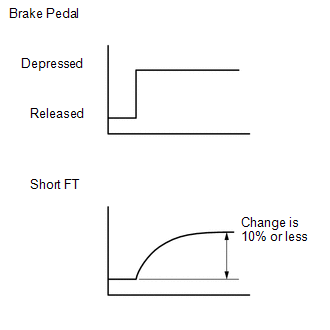 (e) Using the Techstream, read the value of Short FT #1 in the Data List while depressing the brake pedal. Short FT #1 changes by +10% or less. When air leakage from the brake booster is present, the feedback compensation increases because the air fuel ratio becomes lean. (b) Start the engine and warm it up until the engine coolant temperature stabilizes. (d) Using the Techstream, read the value of Short FT #1 and Long FT #1 in the Data List. (a) Perform ignition system On-vehicle Inspection (See page ). *1: If the mass air flow meter sub-assembly is malfunctioning and incorrectly measures the intake air volume to be less than the actual volume, the freeze frame data will show a low engine load value. *2: If the air fuel ratio sensor is malfunctioning and constantly outputs a value indicating the air fuel ratio is lean, the actual air fuel ratio will become rich and the engine may stall. (a) Remove the mass air flow meter sub-assembly. (b) Check for foreign matter in the air flow passage of the mass air flow meter sub-assembly. Perform "Inspection After Repair" after replacing the mass air flow meter sub-assembly (See page ). (a) Check the harnesses and connectors, referring to DTC P0102 inspection procedure (See page ). Jiggle the wire harness and connector to increase the likelihood of detecting malfunctions that do not always occur. Make sure there is not an excessive amount of force applied to the wire harness. (d) Using the Techstream, read the value of Calculate Load in the Data List. (b) Start the engine, turn off all accessory switches and warm up the engine until the engine coolant temperature stabilizes. (e) Enter the following menus: Powertrain / Engine / Active Test / Control the Injection Volume for A/F Sensor / AFS Voltage B1S1. 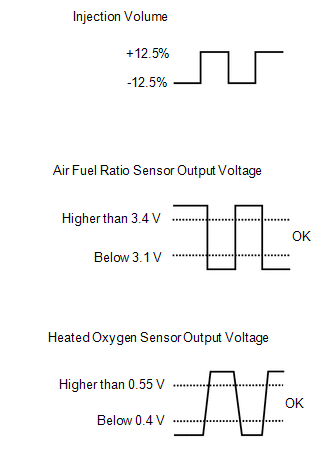 (f) Read the output voltage from the air fuel ratio sensor when increasing and decreasing the fuel injection volume. (a) Check the harnesses and connectors, referring to DTC P0031 inspection procedure (See page ). 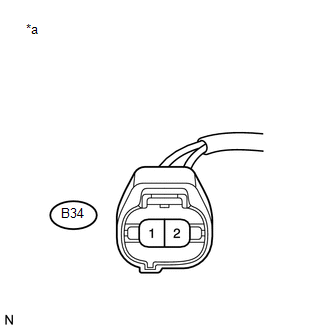 (a) Check the harnesses and connectors, referring to DTC P2237 inspection procedure (See page ). *1: A long time had elapsed after stopping the engine. *2: A long time had not elapsed after stopping the engine. This step is not directly related to engine stall. (a) Inspect the thermostat (See page ). *: Use an actual outside temperature estimated from the Initial Intake Air, Ambient Temp for A/C, and (if possible) the weather when the DTC was detected. (a) Inspect the engine coolant temperature sensor (See page ). If the purge VSV is stuck closed, air fuel ratio compensation by the purge VSV is incorrectly adjusted, and then the air fuel ratio becomes lean and the engine may stall. (e) Enter the following menus: Powertrain / Engine / Active Test / Activate the VSV for Evap Control. (f) Operate the purge VSV and check the air flow. (a) Inspect the purge VSV (See page ). (a) Check harness and connector. Refer to EVAP System inspection procedure (See page ). (c) Idle the engine for 15 minutes or more. (d) Using the Techstream, read the value of EVAP (Purge) VSV in the Data List. (a) Check the ECM connector connection condition. (d) Enter the following menus: Powertrain / Engine / Active Test / Control the Fuel Pump / Speed. 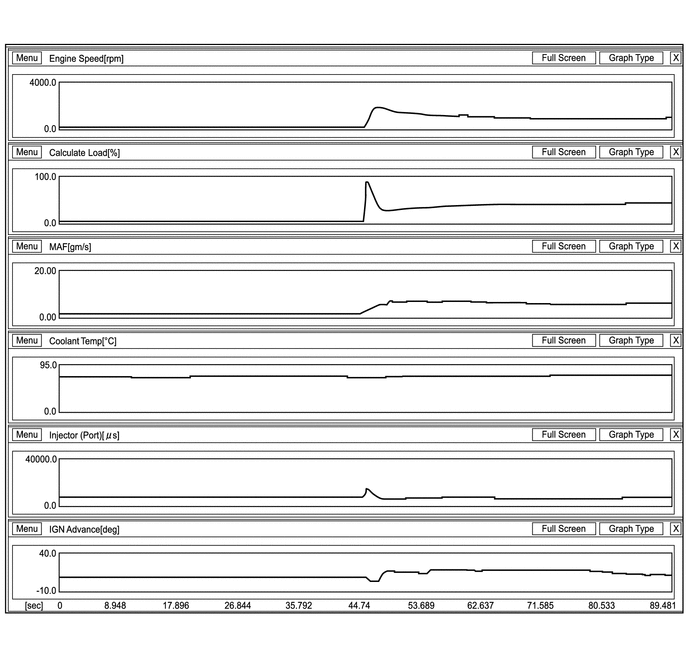 (e) Check whether the fuel pump operating sound occurs when performing the Active Test on the Techstream. While performing the Active Test, make sure that there is no fuel leakage from the pipes, no signs that fuel has leaked, and no fuel smell. If the fuel pump operating noise is abnormal, proceed to step 34. (a) Inspect the fuel pump (See page ). (a) Check the fuel system. Check the fuel pump operation. Perform the Active Test [Control the All Cylinders Fuel Cut]. For the fuel system On-vehicle Inspection, refer to the following procedures (See page ). (a) Check for foreign matter such as iron particles around the fuel pump (fuel pump, fuel pump filter and inside the fuel tank), and for signs that the fuel pump was stuck. If there is foreign matter such as iron particles on the fuel pump, fuel filter or fuel tank, remove the foreign matter. *1: If the mass air flow meter sub-assembly is malfunctioning and incorrectly measures the intake air volume to be higher than the actual volume of air flowing through the intake air surge tank assembly, the freeze frame data will show a high engine load value. *2: As the air fuel ratio sensor output is low before the sensor warms up, the value at that time cannot be used for diagnosis. If the air fuel ratio sensor is malfunctioning and constantly outputs a value indicating the air fuel ratio is rich, the actual air fuel ratio will become lean and the engine may stall. (a) Remove the mass air flow meter sub-assembly (See page ). (a) Check the intake system. Inspect the brake booster assembly (See page ). Inspect the mass air flow meter sub-assembly (See page ). Check the PCV hose (See page ). Inspect the PCV valve (See page ). Inspect the purge VSV (See page ). (a) Perform the Active Test, referring to DTC P0011 inspection procedure (See page ). When the results of the inspection using the Active Test are normal but the valve operating noise is abnormal, check the valve for any signs of problems. If the camshaft timing oil control valve is stuck on, the valve overlap increases and combustion worsens due to the internal EGR which may cause rough idle or cause the engine to stall. (a) Check the harnesses and connectors, referring to DTC P0010 inspection procedure (See page ). (a) Perform the Active Test, referring to DTC P0014 inspection procedure (See page ). (a) Check the harnesses and connectors, referring to DTC P0013 inspection procedure (See page ). (a) Inspect the mass air flow meter sub-assembly (intake air temperature sensor) (See page ). If the intake air temperature sent to the ECM is higher than the standard due to the mass air flow meter sub-assembly (intake air temperature sensor) malfunctioning, the ignition timing may become delayed. (d) Using the Techstream, read the value of IGN Advance and Knock Correct Learn Value in the Data List. 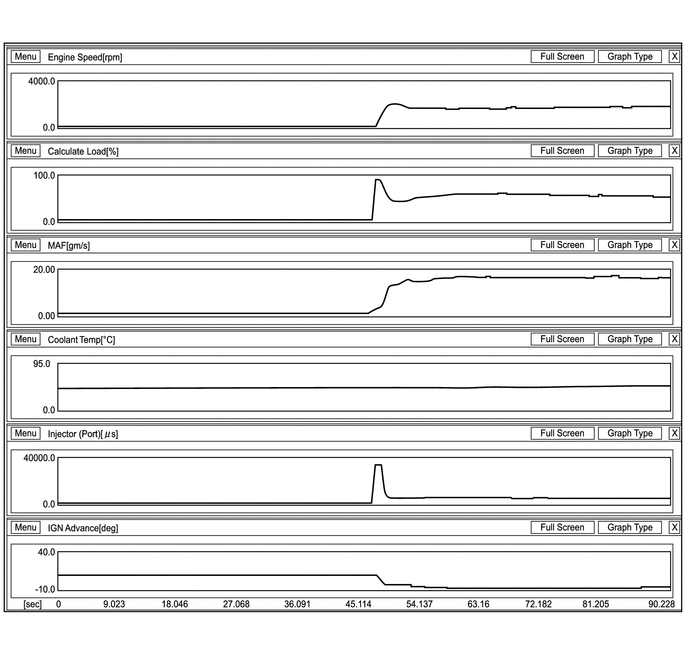 If the results of the checks performed in steps 56 to 64 were all normal and the sum of ISC Feedback Value and ISC Learning Value in the Data List is 120% of the normal value or more, check for carbon deposits in the throttle body assembly. If there are carbon deposits, clean them off to finish the troubleshooting procedure. 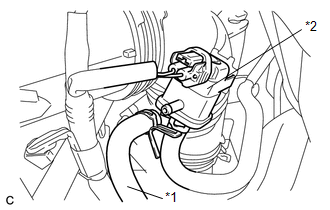 (a) Check the harness and connectors, referring to Fuel Injector Circuit inspection procedure (See page ). *1: Check not only the ON/OFF state of the air conditioner but also the change in air conditioner load. The normal value for the ISC learned value is engine displacement (liters) x 0.9. Even if the results are normal, the power steering system or A/C system may have been malfunctioning. If there are no problems with other parts, inspect the power steering system or A/C system. *3: If the Electrical Load Signal 1 (2 and 3) display changes from OFF to ON, or the "Electric Load Feedback Val" increases, it probably is a malfunction due to a change in electrical load. Check the generator and the continuity and connections between the generator and ECM. Even if the results are normal, the electrical load signal system and/or A/T system may have been malfunctioning. If there are no problems with other parts, inspect the electrical load system and/or A/T system. Even if the results are normal, the park/neutral position switch assembly and/or A/T system may have been malfunctioning. If there are no problems with other parts, inspect the park/neutral position switch assembly and/or A/T system. If the fuel pump operating noise is abnormal, proceed to step 77. Perform the Active Test [Control the All Cylinder Fuel Cut].